Hi guys. 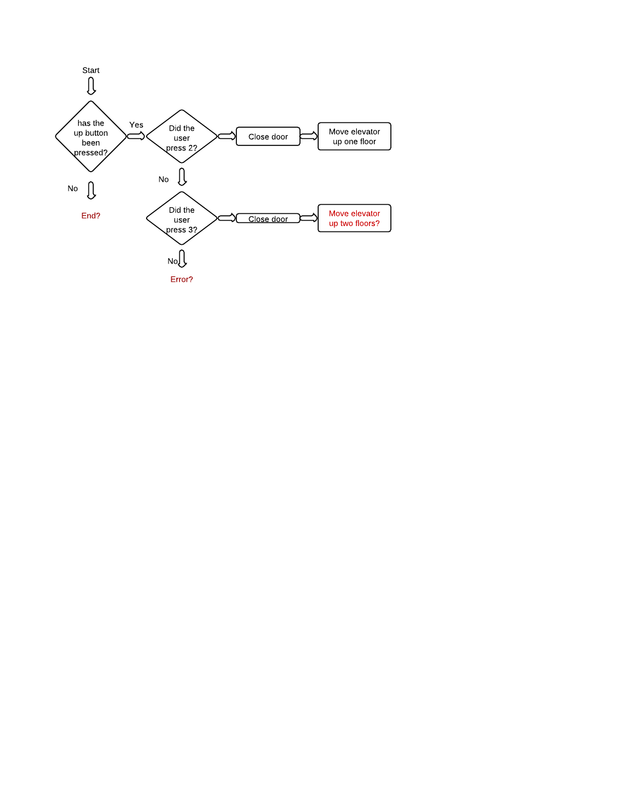 I need some help with this flowchart. Write a program that controls an elevator in a three-story building. Inside the elevator, there are three buttons to make the elevator go to particular floors. Outside the elevator, each floor has one or two buttons to summon the elevator to that floor. The first floor has only an "Up" button. The second floor has "Up" and "Down" buttons. The third floor has only a "Down" button. You may assume that the elevator is initially on the first floor. Your control program should be friendly and responsive to the users of the elevator and should never move the elevator up or down while the doors are open. Check the status of a button inside or outside the elevator ("pressed" = true, "not pressed" = false). Clear a button inside or outside the elevator (make it "not pressed"). Move the elevator up or down one floor. Open or close the elevator doors. I'm not sure if any of the things in red are right..actually I'm not sure if anything on here is right. Could someone maybe help guide me in the right direction? It would be greatly appreciated. Thanks.